Top off your September with the Berklee BeanTown Jazz Festival on September 27th! 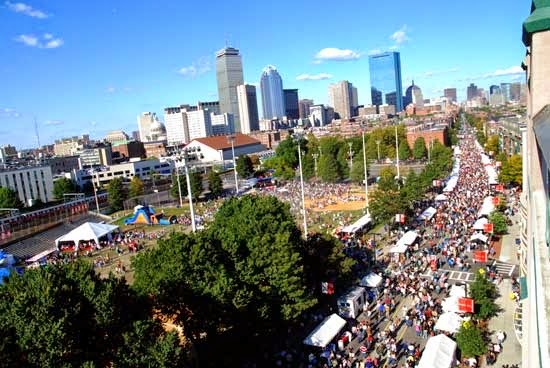 Boston’s biggest block party will be held on Columbus Ave between Massachusetts Avenue and Burke Street in the South End, and is free to the public! This years festival celebrates Jazz: The Global Ambassador, and the Artistic Director is Terri Lynne Carrington. Carrington is a Grammy winning drummer, composer, producer and clinician who was born in Medford, MA. She did extensive touring for more than 20 years with names such as Herbie Hancock, Wayne Shorter, Al Jarreau, Stan Getz, David Sanborn, and many more, and she recently has moved back to her old stomping ground, and was appointed professor at Berklee. With her unbelievable musical talent and experience, there is no doubt that this years festival will be an event to remember! A six block stretch will be filled with three stages, amazing food, and more than 70 vendors. While music fills the air, feel free to check out the face painting, inflatables, photos, and a one of a kind instrument petting zoo! Whether you are coming with family, friends, or a date, it is the perfect way to spend your Saturday afternoon. To check out a full line up of all of the artists, check out the schedule on the BeanTown Jazz Festival website. After your music filled experience during the day, finish off your night at one of the many amazing restaurants in the South End, and a good night sleep at the Clarendon Square Inn! On top of the amazing culture of the South End, the Berklee BeanTown Jazz Festival will make the South End the place to be on September 27th, so make sure you stop by to enjoy everything that it has to offer!